These stepper motors are DC 2-Phase, 2A motors from Vexta. 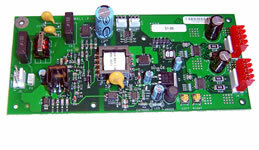 Duct Tape Engineering offers boards that can be adapted to any range of TFT LCD panel interfaces. They are also fully customizible electrically and mechanically to fit your needs. Value added features include: Touch Screen Controllers, Inverter dimmers, and Audio/Speaker drivers. The Scalable Single-Board Logic Computer from Duct Tape Engineering integrates control and interface functions into one board. The flexibility of this architecture has enabled it to be used both as a stand-alone system controller and as a prototyping tool. Once the prototype has been fully developed, the board can be "scaled down" to only the desired functionality for further cost savings. Duct Tape Engineering offers interface board design. This one offers USB to Serial conversion and can be customized to any desired form-factor. Duct Tape Engineering Stepper Motor Controller boards are ideal for embedded designs. The on-board microcontroller can provide exceptional cost savings by eliminating the need for a host computer.